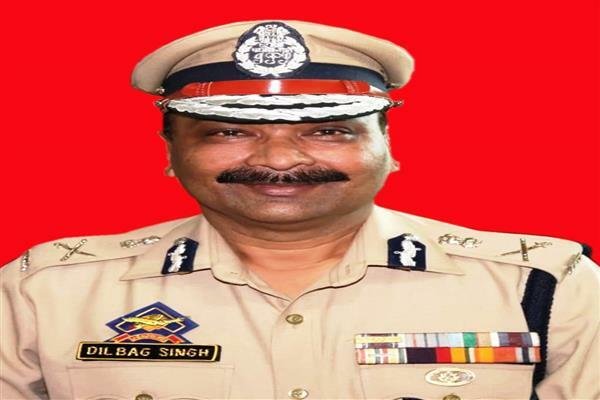 Srinagar, April 16: The Director General of Police J&K Dilbag Singh on Tuesday hailed the security forces for bringing change in Kishtwar, and said that militancy shall be wiped out from the district. DGP on Tuesday visited Kishtwar where he held review meetings to take stock of the preparedness for the parliamentary elections with officers and addressed police, army and CAPF officers deployed in connection with Lok Sabha polls. DGP was accompanied by IGP Jammu, IGP CRPF and IGP BSF Jammu. During his visit to the far-flung areas of the district including Marwah, Dachan and later Kishtwar, he met local police, paramilitary and civil officers, according to a statement issued to news agency. Addressing the officers at District Police Office Complex Kishtwar, DGP impressed upon the officers to dispose of the cases on a fast track basis and keep crime index check and also enhance public relations. “The district has been militancy infested but the sacrifices of police and other security forces brought change and the remaining militancy shall be wiped out from the district,” he said. He stressed upon the establishment of new SOG camps, Nakas and bunkers in Kishtwar and advised the security forces deployed in the district to work in coordination in order to kill the militants. He further said that noose must be tightened against the militants and their overground workers. DGP in his address further stated that because of the safe and secure environment of the region, projects are being executed and development is taking place in the region for which credit goes to Police, Army, BSF, and CRPF who have worked as a team and accomplished the mission of establishing the peace. He paid tributes to the slain forces personnel and said that Jammu and Kashmir Police has earned a good name at the national level due to their sacrifices for the nation. From law and order front, the DGP J&K advised the officers to reach each and every section of society in order to gain the confidence of the general public, besides regular meetings should be held with members of the communities and they should be made stakeholders for maintaining peace and order in the district. During his interaction with the officers of civil administration, police and CAPF, the DGP directed the officers to act tough against white collar criminals by identifying and booking them under relevant laws. Referring to welfare measures, he said that PHQ is looking into various demands and more announcements are expected from state government for the benefit of police personnel. He advised the police personnel to take care of health, hygiene and their families. DGP assured that all the grievances brought into his notice will be addressed. He said all the personnel especially lower ranks will be made comfortable. He directed the officers to perform their duties with zest and zeal during parliamentary elections and ensure that no untoward incident takes place and the whole electioneering process is carried-out smoothly. He said action should be taken against the trouble mongers after identifying them. Earlier, SSP Kishtwar Shakti K Pathak gave resume of the functioning of District Police Kishtwar. The interaction meeting was attended by Munish Kumar Sinha, IGP Jammu Zone, Bhim Sen Tuti, DIG DKR Range, Angrez Singh Rana, Deputy Commissioner, Kishtwar, Shakti K. Pathak, SSP Kishtwar, Addl. SP Kishtwar and other officers of Army and CAPF.